Location: Saigon – Hoi An – Hue – Halong Bay – Hanoi. Upon your arrival at Saigon airport look for our driver and guide who will be waiting for you with a sign bearing your name. The journey from the airport to your hotel will take approximately half an hour and is an entertaining experience full of chaotic traffic and millions of motorbikes. 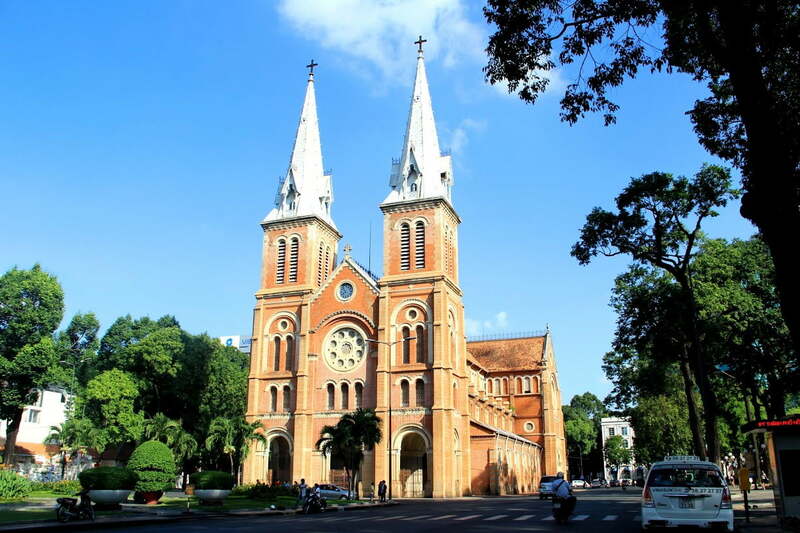 You will be met at your hotel at 08.00am by guide for a morning walking tour through the heart of Saigon’s famous and historic city landmarks including Dong Khoi Street (formerly Rue Catinat), the Rex Hotel, Municipal Theatre, Hotel de Ville and Notre Dame Cathedral. You will then join your vehicle and drive to the site of the former US Embassy (now the US consulate) before visiting the impressive Re-Unification Palace and War Remnants Museum. After lunch, you will take the journey west from Ho Chi Minh City to Cu Chi. On arrival you will be guided through the famous tunnels used by the communist guerrillas during the Vietnam War. The tunnel network stretches over 250km and extends to three levels underground providing you with a remarkable insight into the hardships, courage, determination and terror of a guerrilla war. You will return to your hotel at approximately 18.00pm. Evening free as your leisure. The Mekong Delta is considered the rice bowl of Viet Nam, producing sometimes three crops of rice a year and an abundance of fresh tropical fruits, such as longan, jackfruit, sapodilla and pineapple. The Mekong start in Tibet and journeys through seven countries before reaching Viet Nam where it splits into nine tributaries and empties into the South China Sea. 08.00am, you will be pick up from your hotel, head to My Tho province (2 hours driving). Today, you will travel by boat exploring the mighty Mekong, observing river life and sampling many local delicacies, including the elephant ear fish, for lunch. Travel on wide and narrow tributaries, visit orchards and local produce farms. After a relaxing and indulgent day return to SaiGon around 16.30pm. Evening free as your leisure. Your guide will pick you up 2 hours before for flight time. Depart from Sai Gon to Da Nang. You will be picked up to Hoi An which last for about 15 minutes. Check in your hotel in Hoi An and have a break. In the afternoon, you guide and car will pick you up at your hotel for a half day walking tour. Known as Faifo to early Western traders, Hoi An was one of the major trading centres in South East Asia between the 16th & 17th centuries. A charming 16th century merchant town, with strong Japanese and Chinese influences, Hoi An is best explored on foot. Declared a UNESCO World Heritage Site for its well-preserved architecture, it is also a thriving centre of traditional handicrafts. Wander through the cobbled streets, past low tile-roofed buildings, the bustling central market and the small harbour where colourfully painted boats are moored. Your walking tour will include visits to a private house where members of the same family have lived continuously for centuries in a traditional setting to one of the family chapels built by prominent merchant or offical families as centers for ancestor worship. Continue to Sa Huynh Museum which contains exhibitions from the earliest period of Hoi An’s history. Finally, continue to the famous Japanese Covered Bridge Pagoda, first constructed in 1593 by the Japanese community of Hoi An to link the town with the Chinese quarters across the stream. 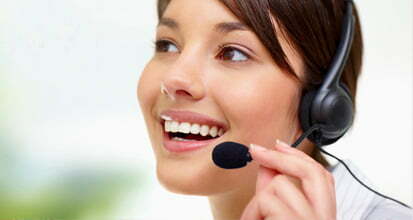 This 3 hour session is a rich & comprehensive gourmet experience. You start with a 1 hour market tour to learn about Vietnamses ingredients & how to choose fresh food. Next is a short talk on the art of Vietnamese gastronomy, vegetables, herbs & spices & how to prepare & use them. The practical includes learning cooking & cutting techniques & how to use Vietnamese vegetable grater & knife. You will get hands-on experience of fresh summer rolls, grilled chicken with lime leaf, banana flower salad, soup with cabbage wrapped shrimp. After lunch in Cooking class, transfer back to hotel. Afternoon is free as your leisure. Our Vietnam Travel and Cruise provides you with a close-up and intimate exposure to both the local farming and fishing communities. Accompanied by your tour guide, you commence the day leisurely cycling along country roads witnessing local Vietnamese rural life first hand, discovering all manner of photo opportunities – coming and visiting a beautiful organic vegetable village, watering and planting vegetable, hoeing a soil with local farmer, riding a water buffalo in a rice paddy field seeing ducks swimming along the rice farm or farmers tending their crops. The photo opportunities are endless. As well you will experience the friendliness of the local people greeting you along the way. 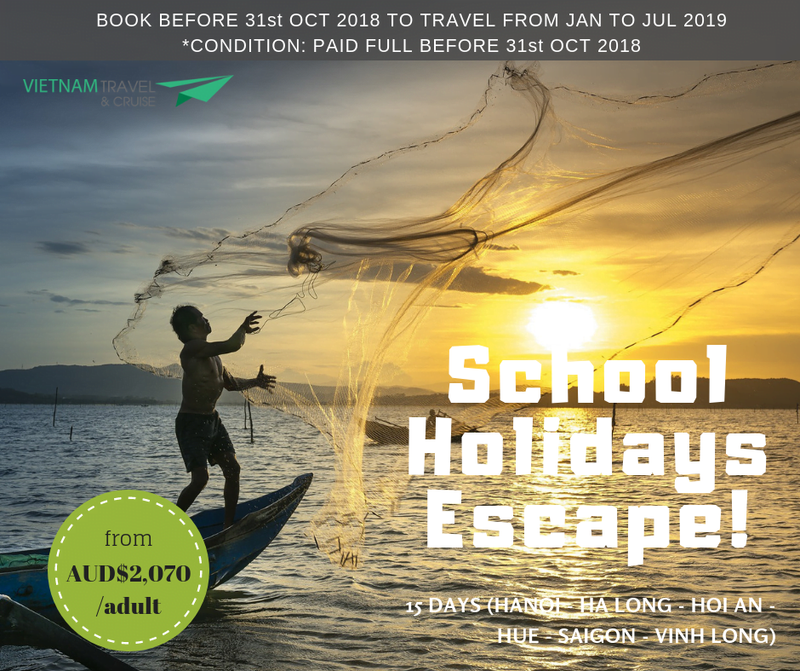 Later you will board our Vietnam Travel and Crusie’s boat for a river cruise to meet and engage with local fishermen and enjoy a hands-on experience of traditional net fishing. You will also experience paddling the unique Vietnamese bamboo basket boat while the waterways of coconut palm paradise. This tour provides you with a cultural window into the ways of life of both our farming and fishing communities. Cycle to a local farming village traveling along picturesque country roads ( Bus or bike are option to choose to go ). Back on-board our Vietnam Travel and Cruise’s boat, enjoy lunch and cold beer or soft drink. 08.30 After breakfast this morning, your private car and guide will pick you up for a 160km journey from Hue over scenic mountainous roads with spectacular views over the coastline. First we stop to visit the MARBLE MOUNTAINS, five stone hillocks, once islands, that now rise sharply from the surrounding ricefields. Riddled with caves and shrines, they are said to each represent one of the five elements of the universe. Then we briefly pass MY KHE BEACH, a famous spot for American soldiers during the Vietnam-American War and continue to tour the CHAM MUSEUM, an elegant colonial building which now houses the finest collection of Cham sculpture in the world. The trip will go pass by LANG CO Beach, the stunning germ of the area. Halfway between Danang and Hue lays the dramatic HAI VAN PASS, the high dividing line between the climate zones of north and South Vietnam. 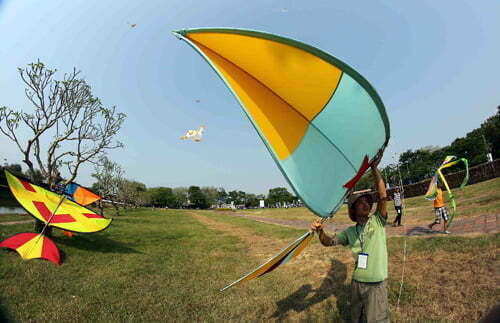 08.00: Today we start the tour to Hue Monument Complex, which is recognized as UNESCO World Heritage. Our driver will pick you up at your hotel and transfer to the boat station in Hue. We board a boat for a trip on the Perfume River to visit the towering Thien Mu Pagoda, one of the most famous Vietnamese landmarks. Differing legends explain how the pagoda came to be – one tells of an old woman who instructed Lord Hoang Nguyen in 1601 to walk contemplatively along the river with a lit incense stick and to build a city at the spot where the incense stopped burning. From Thien Mu Pagoda, we then take a short drive into a lush valley of the river where seven tombs were built for seven Nguyen emperors. Each is an expression of the unique personality of the man whose remains it holds and each is comprised of three elements: a temple dedicated to the worship of the deceased emperor and his queen, a stone stele that records the biographical and historical high points of his life, and the royal tomb itself. We will visit two most famous tombs: Minh Mang and Khai Dinh Tomb. Lunch at a local restaurant. In the afternoon, we return to the center of Hué city. The massive Hue Royal Citadel is the most well known and iconic site in Hué. Begun in 1805 by Emperor Gia Long, it is actually a sprawling complex comprised of the Imperial City, several museums, lakes, and lovely gardens, all laid out in a series of concentric circles. We also visit the Forbidden Purple City, originally built in the early 1800s for the personal use of the emperor and staffed by eunuchs who posed no threat to the royal concubines. Nearly destroyed in the Tet Offensive, the ruins today house the Royal Library and the grounds flourish with mimosa plants and vegetable gardens. After that our car will take you to Dong Ba Market: Dong Ba market is the biggest and most significant central market of Thua Thien – Hue province and the adjacent regions. In Dong Ba market, you can go shopping and see the daily life of local people. The tour finishes at about 16.30 and our car will drive you back to your hotel in Hue. Transfer to Hue airport 2 hours in advance. Depart from Hue to Hanoi. Upon your arrival at Hanoi airport look for our driver who will be waiting for you with a sign bearing your name. The journey from the airport to your hotel will take approximately one hour and is an entertaining experience full of chaotic traffic, distinctive architecture and overloaded motorbikes. We start our Street food walking tour from Hanoi’s largest covered market, Dong Xuan from 17.00. Your expert English-speaking local guide will give you an insight into the intricacies and traditions of Vietnamese food culture including details on ingredients and historical backgrounds of popular northern dishes. We eat as we go, trying seasonal fruits and sampling some tasty snack from a street cart. Pho- or rice noodle soup- is omnipresent in Hanoi, appearing anywhere from street vendors to high end restaurant chain Pho 24 This universally famous food is best enjoyed in Hanoi, where it was “invented” in the early 20th century. Some is served with chicken and some with beef. Each type of meat entails a variety of sub-dish, using from beef tenderloin to beef brisket, chicken wing to chicken thigh. You can choose among three light dinner dishes, from the extremely popular “Phở” (Noodle soup), “Bún chả” (grilled pork vermicelli soup) and lastly, our personal favorite “Bún Bò” (Beef rice vermicelli soup). In the end, the guide will take you to Ta Hien street where is one of the hot spots for beer, sitting at a street corner in Hanoi old quarter with a beer glass. The Food tour is end at 20.30 in Hoan Kiem Lake, our tour guide will take you back to your hotel and say goodbye. 8.00 – 8.30: Bus and guide will pick you up at your hotel. On the way to Halong city, enjoy the journey through the rich farmlands of the Red River Delta and the scenery of rice fields, water buffalo and everyday Vietnamese village life. 12.15: Embark on Cruise. Welcome drinks would be served before receiving cabin and cruising route briefing. Enjoy a delicious seafood lunch while our boat slowly cruise through amazing limestone seascape. 16.25: Enjoy easy kayaking around the fishing village, then return to the vessel for your own leisure. Fresh fruit platter will be served on the sundeck. 17.45: Keep cruising to the overnight anchorage area. 21.00: Enjoy evening activities – Movies (Night), Board Games, Fishing or karaoke. 09.00: Return to Cruise. Check out and settle the bill. 12.00: Disembark and back to Hanoi. 16.00: Arrive in Hanoi. Check in your hotel again and enjoy your free time in Hanoi. 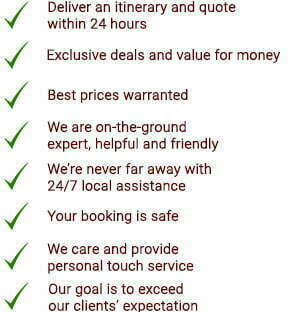 You will be picked up from your hotel for the one hour journey to the airport. Be sure not to pack any valuables in your checked in luggage and remove all sharp objects and liquids from your carry on. Experience and friendly English-speaking local guide. Domestic flight: Saigon – Danang, Hue – Hanoi. Welcome gift + Sim Card.